Users can now skip the Tools tab and narrow down results from the search bar. Google has announced a new search bar command that enables users to filter results for a desired date range. The “before:YYYY-MM-DD” and “after:YYYY-MM-DD” shortcuts yield results for before, after, and within the dates specified. New analysis of more than 73,000 business locations, conducted by Uberall, asserts that 96 percent of SMBs, mid-market and enterprise businesses with offline locations fail to meet the criteria for voice-search readiness (VSR). Majority trust Amazon reviews. The survey of 2,001 Americans who’d made at least one purchase on Amazon in the past six months, found that while price was the “biggest factor” in their decision-making, reviews were also a significant consideration. Viber, the messaging app has confirmed that users now have the option of subscribing to have “local numbers” that can receive phone calls and SMS messages as if those calls and messages are being sent to mobile numbers in specific regions. Viber Local Number, as the service is called, is available to anyone globally but for now the numbers you can register are in the US, UK and Canada, with more countries getting added soon. Skype, for one, has offered the option of getting a local number in a specific region, both to make and receive calls, for years. There have also been companies that have stepped into the feature gap between the existence of the capability and Viber yet to launch anything of its own. 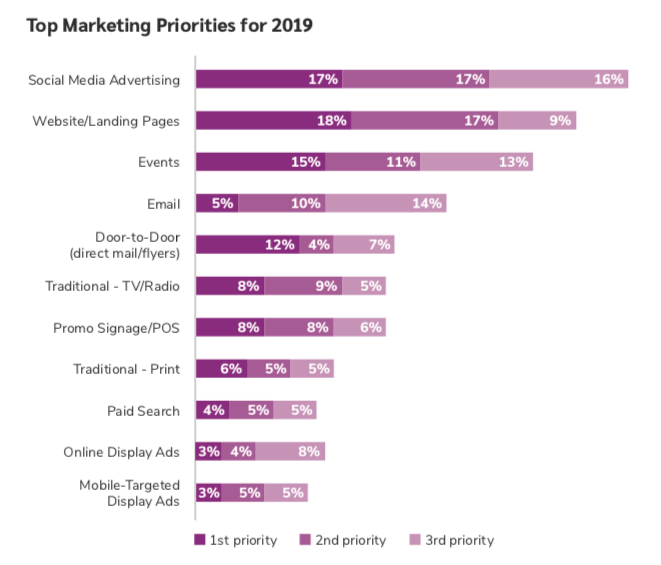 Google has spent years building out a third party partner/reseller network focused on small businesses (SMBs) and in the latest survey by BrandMuscle, the marketing tactic seen as the greatest priority came out as paid social. In the survey of 1,000 SMBs, social media advertising was the overall top marketing priority.The survey population consisted of franchisees, dealers, retailers and channel partners, 73 percent of which had only a single location and 50 percent of which had fewer than five employees. According to a piece on Search Engine Land, one of the “positive” findings, was that most of the SMBs in the survey recognised that their marketing was not keeping up with consumer behaviour. Less than a third of respondents judged their marketing programs “up to date.” And 84 percent wanted to learn more about marketing to improve their performance. This indicates an ongoing appetite for more education. Over the weekend Many SEOs and site owners reported seeing pages drop out of the Google search index. The issues were visible in Google Search Console and when using the site command in a browser. It was apparently the result of a technical issue at Google, according to Google’s John Mueller. Mueller said it has been resolved.